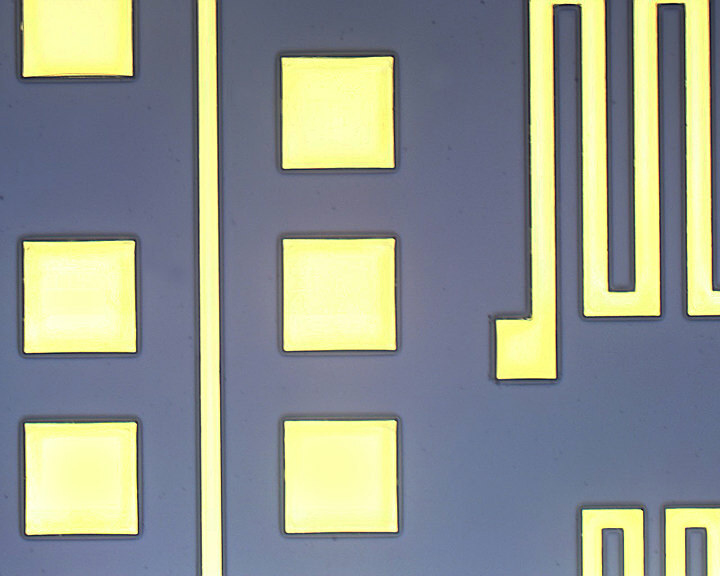 In semiconductor processing, gold was often deposited by PVD and CVD methods. While those techniques sufficed for a time, they also brought certain significant problems such as material wastage, slow deposition rates and downtime for necessary equipment cleanings. Some have used wet benches for gold plating, but with limited success due to the high non-uniformity inherent in that approach. Also, manually operated wet benches are prone to undesirable levels of variation and the risk of human exposure to open baths of toxic chemistry. Fortunately, Solstice® electroplating systems are designed to overcome all of those limitations, providing fast, waste-free, cost-efficient, and production-oriented solutions, with uniformities in the 1% range. 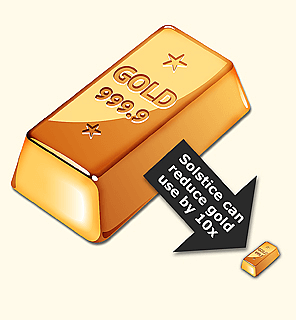 Solstice eliminates gold loss, reduces gold expenditure for greater gold plating savings. For gold deposition, one fundamental challenge with PVD and CVD was that these techniques didn't coat just the wafer, they also coated the entire inner surface of the deposition chamber — in this case, with a very costly material. Theoretically, the "oversprayed" gold could be recaptured and reclaimed; but in practice, the cleaning and reclaiming processes were very difficult, time-consuming, potentially dangerous (perhaps requiring the use of hazardous chemicals such aqua regia) and ultimately inefficient. Consequently, a great deal of the oversprayed gold was permanently lost, which significantly increased the total cost of ownership of the process. By contrast, Solstice electroplating only deposits gold onto the wafer specifically where it is needed. There is no "overspray" or waste of gold. Also, there is no equipment downtime for chamber cleanings and no need for reclamation efforts. Instead, the Solstice gold plating process is clean and simple, precise and efficient. It saves cost substantially by reducing gold usage and eliminating waste. Further Solstice gold reduction comes from the fact that electroplating is a self-purifying process, so it requires only four nines of purity in the electrolyte instead of the six nines required in evaporation pellets or sputtering targets. Solstice electroplating is specifically designed for markets that use ≤200mm wafers, and it provides significantly faster gold deposition rates — typically from 150 to 300 nm/min. This means that Solstice can deposit gold roughly 10 times faster than the previous deposition methods. Solstice electroplating further reduces cycle times because it is intrinsically a "fast-start" process. No vacuum is required, so there is no need to wait an hour or more for pump-down before processing can begin. Also, one wafer can be run at a time if desired, without incurring any overhead penalty. The resultant savings in time and increased throughput with Solstice can add an important level of cost efficiency. Solstice-enabled technique can save even more in gold usage! 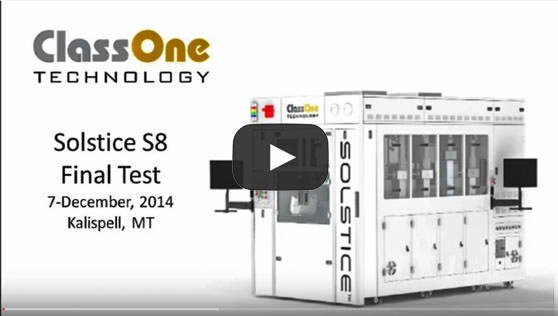 Because of its unique 8-chamber design the Solstice S8 makes it easy to utilize a multi-metal stack in place of a solid gold layer, and as a result, uses much less gold than would otherwise be required...For example, a feature that previously required a 5µm layer of solid gold can be replaced with a "sandwich" of 0.25µm Au, 1µm Ni, 2.5µm Cu, another 1µm Ni, topped with 0.25µm Au — to achieve equivalent functionality while reducing gold usage by a factor of ten! And Solstice's multi-chamber design enables it to easily deposit the Au, Ni, Cu, Ni, and Au layers all in a single cycle; so no additional process steps or time are required to gain these very significant cost savings. The magnitude of potential gold savings can be computed simply by extending the example above: Assume that a fab is running 1500 wafers per week through a metal lift-off process where 5µm of gold is deposited over 50% of the 150mm wafer area. Further assume that all oversprayed gold is recovered and that the gold costs $1200 per troy ounce with no additional processing fees for the purity. Under those conditions the user's annual gold cost would be approximately $2,150,000. However, with the same operational assumptions, if the Solstice Au/Ni/Cu/Ni/Au "sandwich" were used, total deposited metal costs (Au + Ni + Cu) would be reduced to just over $108,000 per year — yielding an annual savings of over $2,042,000! The gold savings in the first year alone would more than pay back the cost of the Solstice tool! And if gold were to rise in price, the payback would be reached even more quickly. The bottom line is this: Solstice electroplating can deposit thicker gold layers more quickly and efficiently without gold waste. There is no downtime for cleaning vacuum chambers, more uptime for more streamlined processing — and potentially enough gold savings to pay for the equipment within a year.